Medical Laboratory Science master's second-year student Meagan Aguirre knew that the work of the laboratory was a bit of a mystery to students in other health professions. For that reason, she said, said the chance to share more about MLS was an opportunity she couldn't pass up. "Nobody knew what we did," she said. 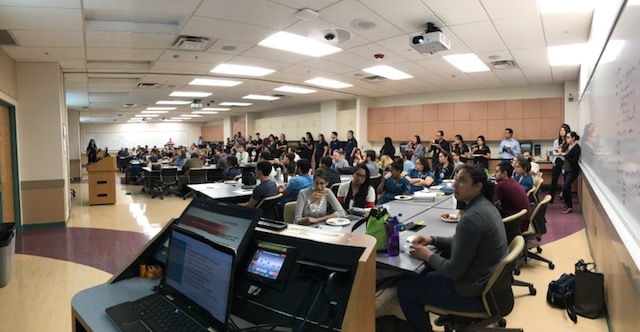 Aguirre and three fellow MLS master's students organized "Lab Tests 101," an interprofessional lunch-hour lecture that drew a full house on Sept. 14. The students used the case study of a 78-year-old woman who suffered a compound leg fracture and an open head wound after falling in her bathroom. The patient was pre-diabetic and had a history of acute myeloid leukemia, anemia, thrombocytopenia, and depression. The students analyzed the patient's ordered lab tests to get a better picture of her health and provide crucial information to direct her treatment, such as her AML status, pH and blood gas levels, kidney and liver function. Aguirre presented on hematology and fellow students Celia Aranda, Mike James, and Matt Landry presented on blood bank, chemistry, and microbiology, respectively. Aranda additionally served as a storyteller, sharing the background of the "patient" and weaving together the various lab tests and their purpose. "Ultimately, we all wanted to stress the importance of the laboratory," Aguirre said. Apparently, their mission was accomplished. "Everywhere I go, I hear 'Hey, you gave that presentation!" Aguirre said, with a laugh. "We're not just a bunch of nerds in a lab."